DENIM x Pleated Mini Skirt. DENIM x ALEXANDER WANG Pleated Mini Skirt. 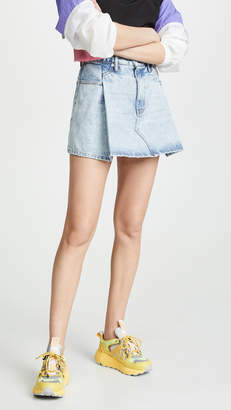 - size 24 (also in 26,27,28,29) DENIM x ALEXANDER WANG Pleated Mini Skirt. - size 24 (also in 26,27,28,29) 100% cotton. Unlined. Light fading and distressed detail. Zip fly with button closure. 4-pocket design. Pleated detail. Skirt measures approx 14 in length. Made in USA. DENR-WQ10. 4D995454EG. Renowned for his perpetually evolving recontextualization of the urban uniform, designer Alexander Wang launched Denim x Alexander Wang in 2015. The brand utilizes cutting-edge techniques and hand-finished methods combined with unique wash and dry processes to achieve a special, yet clean and functional new take on denim. Crafted with all the nuances desired by vintage denim enthusiasts and Wang himself, each pair of denim possesses that innate signature Alexander Wang model-off-duty slouch.